Stains in the carpet are a part of life. They are bound to happen and when they do it is best to clean them up as soon as possible. 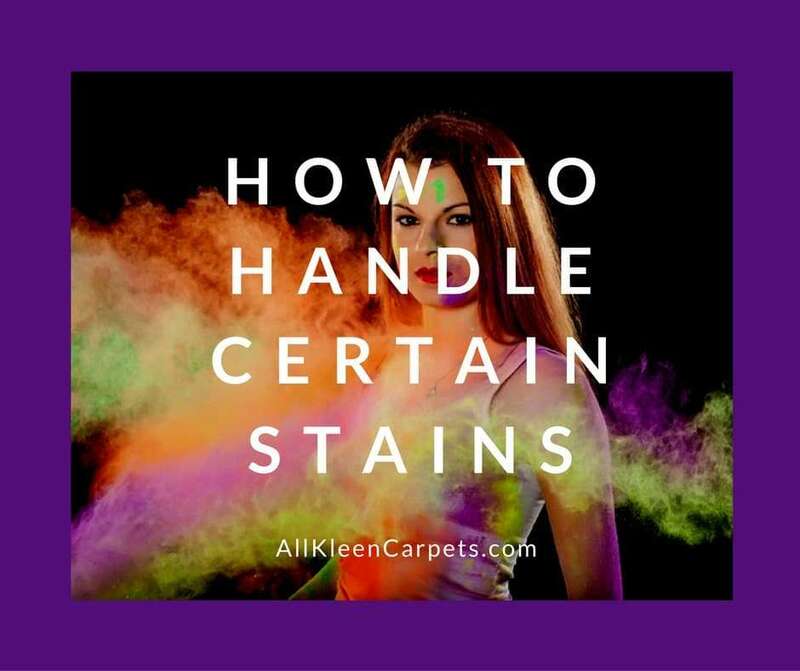 The best way to ensure stain removal success in your carpets is to know what was spilled, what type of stain it is, and how it will affect your carpet. This will enable you to find the right cleaner for the type of stain and get it clean. Water based stains are usually the easiest to clean from carpet. The best way to ensure success with a water based stain is to clean it while it is still fresh. After removing any solid pieces, a little plain water can be used to clean it up. Use a clean white towel to blot gently working from the outside edges in toward the center. If the stain has had a few minutes to set, mix a mild solution of eight ounces water and a quarter teaspoon of clear mild hand dish soap and blot again. Make sure to rinse any soap out with clean water once the stain is removed. There are some water soluble stains that are protein based and this will make them more difficult to treat. Enzymes in protein-based water soluble stains become darker when exposed to heat or acidic items and grab onto carpet more fiercely. Blood is a protein based water soluble stain and should be be treated with cold water immediately. If water is not working to remove the stain then water and dish soap should be used on wool. One tablespoon of ammonia mixed with one cup of water can be used on non-wool carpets. Hydrogen peroxide can be used on white carpets. Fat and oil based stains can be very difficult to remove from the carpet because fats and oils naturally stick to other fats and oils. If you have a synthetic fiber carpet these types of stains will grab on to the petroleum in the carpet. Some carpet manufacturers are aware of how difficult it can be to get these stains out of synthetic carpets and add treatments and coatings to the carpet to help with stain cleaning success. If your carpet has a stain fighting treatment you can usually treat a fat or oil based stain with the same mild dish soap and water solution that you treat a water soluble stain with. If you have an untreated carpet you will want to use a certified dry carpet cleaner. To use the dry cleaning solution blot the stain then apply solution and blot with water to clean any leftover solution in the carpet. Let the area dry and then vacuum. If wax or gum get into the carpet you will want to do whatever you can to avoid them getting ground in the fibers, especially if you have a medium or deep pile carpet. When these items get ground in attempting to peel them up can significantly damage the carpet. The way to remove wax and gum is with a lot of patience and some ice. Cover the wax or gum with ice and allow it to freeze. This can take about 20 minutes or longer. Once the wax or gum is frozen gently start pulling the substance from the carpet starting on the outer edges. For wax residue still hanging out grab an old towel that you don’t mind transferring the stain to and an iron. Set the iron on medium heat, lay the towel over the wax and lay the iron on the towel for just a few seconds. The heat of the iron should allow the residue to transfer to the towel. Repeat this process with a clean part of the towel until all the wax is removed. Stains on the carpet are not fun and can invoke panic. The worst thing you can do for your carpet with any stain is to harshly scrub at it. Even if you get the stain out you will rough up the fibers and break them down. This also leaves it vulnerable for stains in the future. If you have a stain that will just not blot up call in a professional carpet cleaner for some expert stain fighting help. All Kleen has a team of trained carpet cleaning technicians ready for all your carpet needs. Make an appointment online.